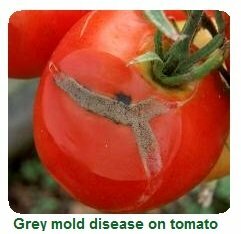 If you have a plant disease like fungus, mold, mildew or blight, you need help, and we've got it. Controlling plant pathogens and diseases the organic way for healthy and safe vegetables to eat. 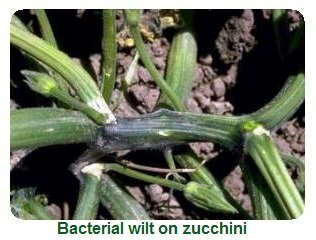 Plants that are susceptible to mildew, such as peas, pumpkin, zucchini and cucumber can benefit from a milk spray. 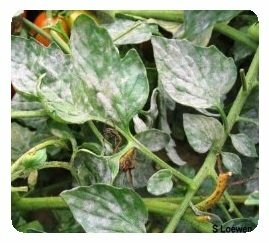 Use full-cream milk and spray every few days on the leaves until the mildew is under control. "Damping off" is caused by fungi such as Phytophthora and Pythium. Seedlings, like lettuce, suddenly collapse with the rot. Soggy conditions, overcrowding or too much peat in the mix can be the cause. Try letting the soil dry out on the surface in-between waterings, and even sprinkling a layer of sand on the surface. Wilt can affect many plants, and the fungus spores can remain in the soil for years. Use any of the organic fungicide ideas as for mildew above. If out of control, practise good crop rotation. Clean pots: Between seasons with clay pots, give them a good clean if any sign of disease or pests was in the previous plants. Fusarium wilt in potted herbs plants are an example. A soak in bleach works, but then you must re-soak in plain water to remove the bleach. One part vinegar to 5 parts water is a better soak solution, and give the pot a good scrub down also. See our other pest pages. . .
Natural Pest Control Remedies Exactly what solutions have proven to work! The A-Z of Garden Pests Have you got one or more of these garden pests? Check these out.